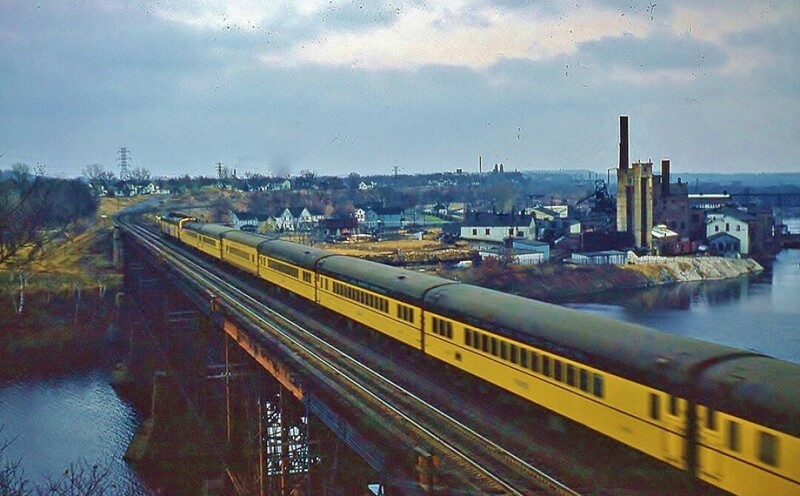 We caught sight of these terrific passenger rail photos on the You Know You are From Eau Claire When... Facebook page. They were taken by John Anderson, who grew up in Eau Claire in the '50s and 60's before leaving in 1967. (He currently lives in Norman, Oklahoma.) Apparently, John was an avid photographer as a kid, as he's been resurrecting and sharing countless fantastic images of Eau Claire (like these). It's a real gift to see the city back then, in color no less. "....in contrast to cars and airplanes and other things in which small boys also were passionately interested, trains were clearly more important to the way the rest of the world worked. Trains brought everything into town: one's food, Dad's new car, most things on store shelves, heavy machinery, express boxes and packages, the mail, Grandma on a visit, Dad back from a trip. 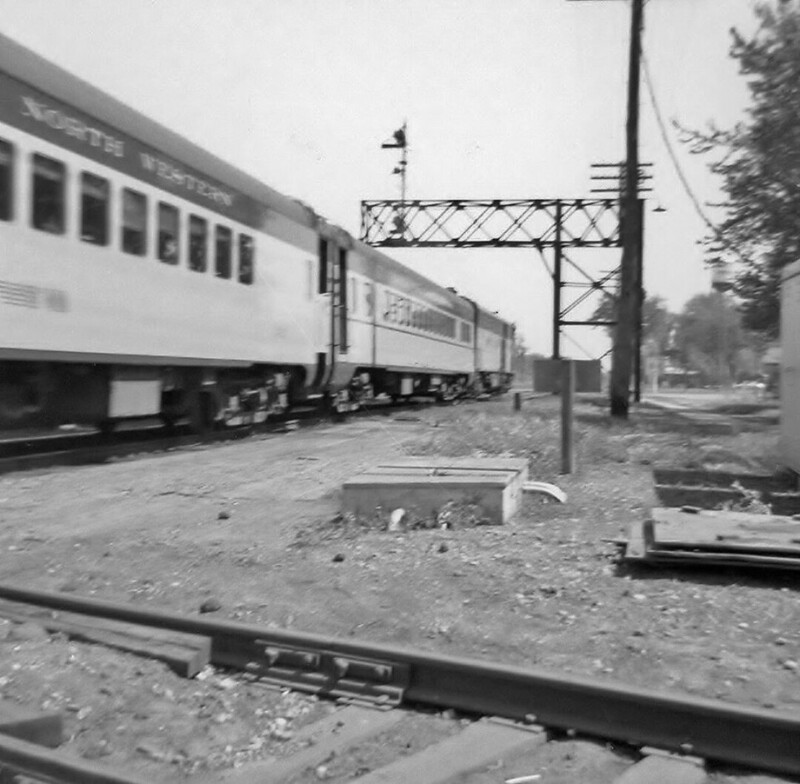 A lot of adults in town had relationships with the railroad – as employees, as travelers, as business owners and farmers relying on the railroad. Trains were a part of life, more important than the weather." This quotation from THE SPIRIT OF STEAM by Bill Withuhn, Curator of Transportation at the Museum of American History, Smithsonian Institution, Smithmark, c.1995. Photo #1 of 5: Once Upon A Time...on a gloomy Sunday afternoon in November of 1958 — It was a cold and windy day waiting on the Old Wells Road Bridge for the late arriving '400' from the Twin Cities. Even then, there were news stories that the Chicago North Western wanted to abandon this passenger train. Suddenly, there it was, crossing the Chippewa River at speed. Wish I'd taken a few more of these scenes, before the '400' vanished forever a few years later. But, what did I know? I was only 14 then. Photo #2 of 5: Boarding the Chicago North Western '400' with a school safety patrol group headed to Washington, D.C., in May of 1956. 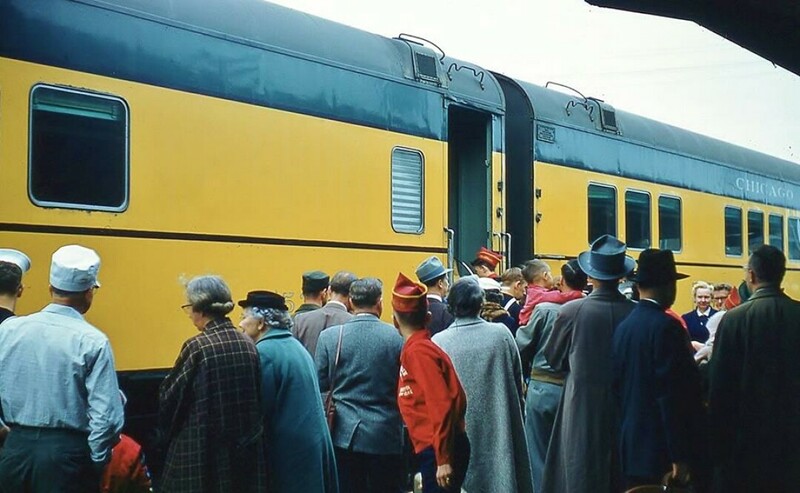 At the Eau Claire depot, early afternoon departure, and crowds like this of both passengers and those seeing them off were not unusual in the day. We connected in Chicago with the Baltimore and Ohio 'Capitol Limited', later that night and headed east to the Nation's Capitol. Photo #3 of 5: Dad boarding his favorite 'ride' for Milwaukee. He and the boys from work enjoyed this. Just after the conductor lifted their tickets in coach, they'd head directly to the lounge car for a little poker along with bourbon and cigars, of course. Then, when the dining car opened later down the line, it was time for fish dinner before arriving at their destination. Those were the days....and this photo dates from 1956 or 1957 at Eau Claire. 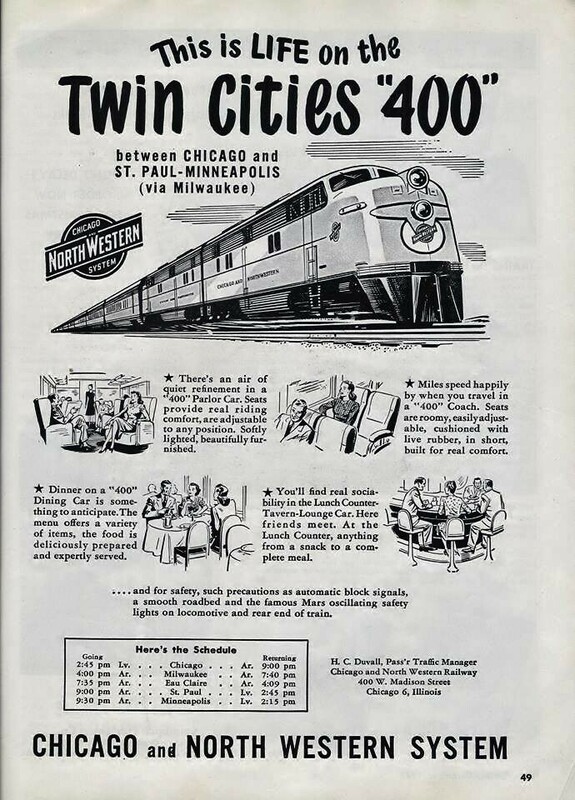 The 'TWIN CITIES 400' was the official train name to the very end with the last train stopping in Eau Claire on July 23, 1963. Photo #4 of 5: My sister and a 9th Ward Lincoln School group enjoyed a memorable out-and-back to Merrillan, WI, in the late 1950s. She took this black & white snapshot before returning to E.C with her class-mates. I think they had picnic lunch while waiting for the return train to Eau Claire, about 45 miles back up the line. Only one engine shown and this might indicate the declining patronage on this train and that fewer passenger coaches were needed. Anyhow, the handwriting was on the wall; on a day in its prime, the '400' was a long train and ran with anywhere from ten to thirteen matching passenger cars pulled by two locomotives. 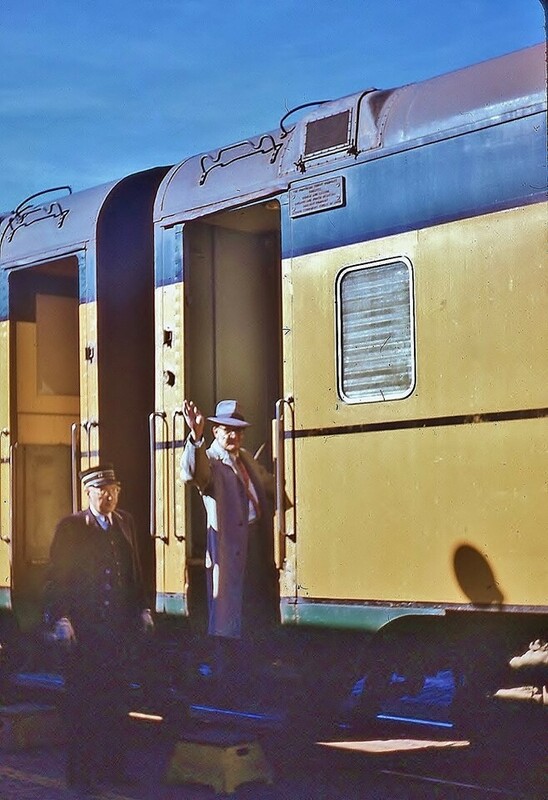 Always included on this streamlined green and yellow train was the pub / lounge, a full dining car, along with the first class or 'parlor' / observation car. Both Madison and Putnam Streets were blocked to vehicle traffic during its short station stop in Eau Claire. Photo #5 of 5: I found this promotion posted with the West Central Wisconsin Rail Coalition on FB. It looks like an old magazine ad from the late 1940s or earlier 1950s. The schedule at the bottom was revised in the mid-1950s to show both trains operating about three hours earlier, each way. Thank you, internet! Above is just one of the many fantastic color photographs posted by John A. Anderson over on the You Know You are From Eau Claire When... Facebook group. He says, "Camera pointed east, back toward Half Moon Beach area. Sunday..."